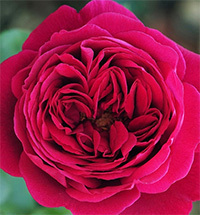 Tess of the D Urbervilles roses were first bred in the United Kingdom prior to 1997 by David Austin. David is a fabulous rose breeder who has blessed us with a wide range of roses for our gardens. He specializes in Old English shrub and climbing roses, and you will find his creations in gardens around the world! 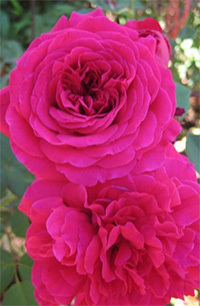 This variety was created by crossing the rose The Squire with an unnamed seedling. 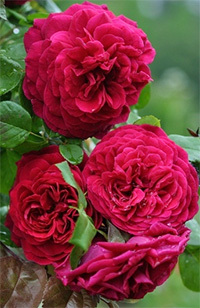 The result is a bright crimson shrub rose that has a very strong old rose scent. The blooms on the rose Tess of the D Urbervilles will reach an average diameter of just over 3 inches across and the blooms will be extremely full, which is typical of most of David’s roses, having close to 100 petals per bloom. The plant itself will grow unusually tall for a shrub rose, reaching heights of about 8 feet tall at full maturity and spreading out to almost 4 feet across. The rose Tess of the D Urbervilles is a great choice for cut flower arrangements and you should have no trouble growing this rose in zones 6 through 9. Growing the rose Tess of the D Urbervilles is not all that tough and if you have any experience with growing roses in the past, then you really shouldn’t find this one to be all that challenging. Like most roses, the most important decision you will make in the life of this rose is where in the garden you choose to grow it. Roses require a lot of sun light if you want them to perform at their best and this one is no exception. Try to pick a spot in your garden that gets no less than 6 to 8 hours each day of full sun light, but more is even better. You also will want to grow your Tess of the D Urbervilles roses in soil that drains very well. This is not all that hard to do but it amazes me how many growers overlook this very important aspect of rose growing. Roses that are grown in poor soil will almost always under-perform, and worse, they often pick up a variety of diseases or pests that can devastate the plant. The easiest way to resolve this issue if you are unsure of the quality of your garden soil, is to pick up a bag or two of a good quality soil mix that is designed specifically for growing roses. Your rose Tess of the D Urbervilles will thank you for it in the long run. 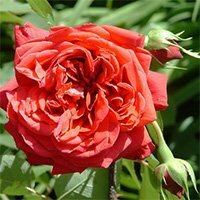 Getting your rose Tess of the D Urbervilles into the ground is not difficult and most growers are able to get the job done with just a few basic hand tools and a little bit of their time. How you go about planting your rose depends just a bit on how you purchased it. If you picked up one at a local nursery, then there is a very good chance it was already potted in a container. These are the easiest roses to plant. Dig your hole at least twice the diameter of the container and equally as deep. This will keep the bud union at its original planting depth, which is very important, and it will also give you plenty of room for your soil mix around the roots. If you bought your Tess of the D Urbervilles roses online, they may have shipped them to you as bareroot plants, which is not uncommon. For these you should first soak the roots overnight in a bucket of room temperature water, prior to planting day, to rehydrate the roots. Then dig your hole as wide as the longest roots that are on the plant, and deep enough to allow you to place the plant on top of a mound of soil while keeping the bud union no more than an inch or so below the surface. Once you have your rose Tess of the D Urbervilles set in place on top of the mound, spread the roots out in all directions and then back fill the hole at least halfway to start, using your soil mix. Give the loose soil a heavy watering with your garden hose until the soil flows all over the roots like mud, then you can go ahead and finish filling the hole the rest of the way. Give the soil one last heavy watering and top off any final settling that may occur, but do NOT tamp down the soil. This method should ensure that you aren’t getting any air pockets around the roots of the plant. Taking care of the rose Tess of the D Urbervilles is not hard either and once again, any prior experience you may have growing roses will certainly come in handy here as well. You will need to make sure that you are providing your roses with enough water and nutrients while taking care not to overdo it. For most climates this usually amounts to one deep watering per week. If your region is very hot or dry then you should probably check on them every 4 to 5 days just to be safe. You also should give some thought to giving your Tess of the D Urbervilles roses a dose of a granular all-purpose fertilizer in the spring time when the leaves start to open. This will get them off to a fast start. Like most of David’s roses, this one is also a repeat bloomer so it will benefit from additional feedings over the course of the growing season. I will always give my roses a second feeding right after they complete the first big bloom, with a third feeding coming sometime around mid summer for those late season flushes. Your rose Tess of the D Urbervilles should do nicely on this schedule also. You should prune the rose Tess of the D Urbervilles in the very early spring or late winter, depending on your region, when the weather warms but before the leaves have opened up. This will make the task of pruning so much easier. First thing is to remove all the dead and discolored wood from the plant. Set your cuttings aside for now. Second, prune back the lateral canes that overlap one another so they do not compete for sun light when the leaves fully open. Lastly, give the remaining canes a 30% cut back to promote new growth. This is also the best time to clean up around the base of your Tess of the D Urbervilles roses and get rid of all the debris that often collects there. Throw all of this material away in the trash with your cuttings. Never let dead matter lay around your roses. 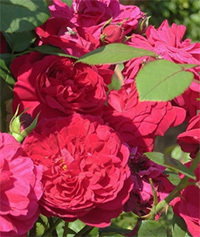 Finish up by giving your rose Tess of the D Urbervilles a fresh layer of mulch for the new season.